Today is Memorial Day. Here in the United States, we honor those who have served and given the ultimate sacrifice so we can live in freedom. Please remember those who wear the uniform. Kiss a veteran today (I did!…my husband, Bill). 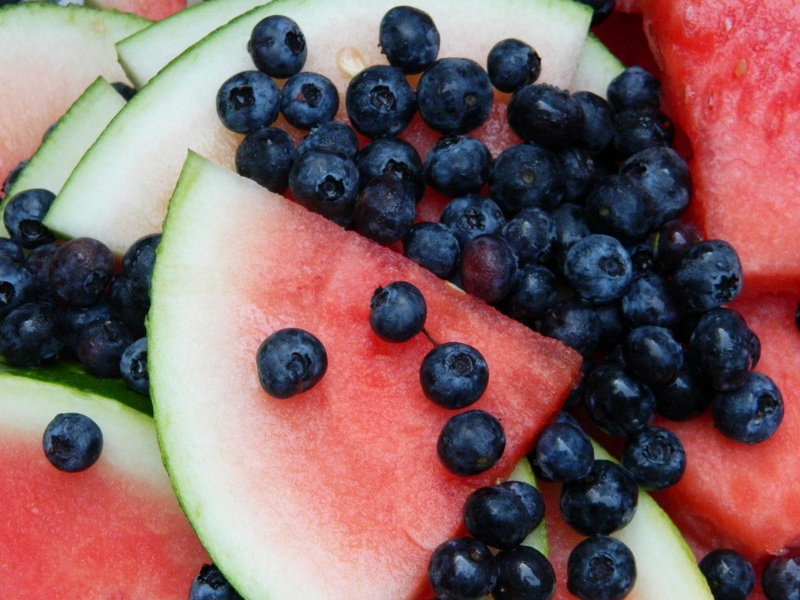 Enjoy your cookouts and picnics! As always, thanks for reading. Feeding the Traveler, Or, What Do Eloping and Chili Have in Common? Once again, I couldn’t decide on the better title so I put them both. Mom always said you should have something ready to eat for when the travelers arrive. It didn’t matter what time of day or night they arrive or how long it took them to get there, they would be hungry, she said. In 1998, I took my new husband home to Florida to meet mom and dad. (Key words “new” and “meet.”) I met Bill, and six months to the day from when we met, we were married. We started planning a wedding but mom was ill with cancer and the thought of putting her through travel and a wedding was too much for me to think of. So, Bill and I eloped at 5 p.m. the night before Thanksgiving. It was an elopement complete with a wedding Mass, two priests on the altar, and some surprise guests who showed up at the historic Old Post Chapel at Fort Meade, Maryland. (Word apparently leaked out about something special happening at Mass.) A few weeks later, I took my new husband home to meet the parents. It was a done deal, mom and dad, so you better like him! We traveled from Maryland to Florida. Mom was not doing well but you can guess the rest. We arrived and she had a meal ready for us. Bill remembers the menu to this day: her homemade chili, corn bread, tortilla chips and all the toppings. Dessert was a store-bought cake but that’s okay mom, you were not the healthy mom who baked all those wonderful goodies for so many years. They loved Bill and Bill loved them. She lived long enough to hold our newborn baby boy, Patrick, now 12, born in October 1999. Some say she died happy because of that. Sometimes you don’t know when people will arrive, so food that keeps in the oven or on the stove, or even a well-prepared cold-cut plate, are good options. Chili or homemade soup paired with a salad and bread works well. Grilled cheese is great for late-night arrivals. (Assemble the sandwiches ahead of time and put them on the griddle when people arrive.) Other options are crockpot recipes. These will keep warm as long as you need them to without the meat getting tough. Plus, all you do when people arrive is serve the food, no need to fuss with the prep so you can focus on the ones who traveled to see you. A pot roast is typically a chuck roast which is cooked slow and long to make it tender. Its nature makes it a good food to have holding for the arrivals. It’s not a cut of meat you would put on the grill and enjoy like a steak. For more on Beef 101, here is an informative blog by the Frugal Dad. 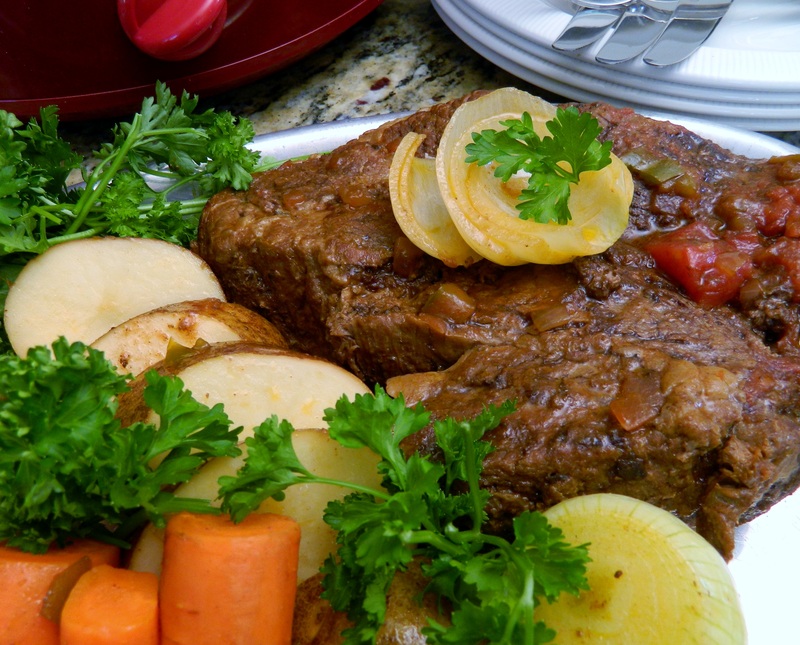 And, below is a succulent crockpot/pot roast recipe from my sister, Susie. She says it’s a “McKinney family favorite.” I cooked it and I can see why. Maybe it will become a favorite of yours too. What do you like to make to welcome your travelers? Rub one packet seasoning mix over both sides of roast. Heat olive oil in Dutch oven or large skillet over medium heat. Add roast and sear both sides until browned. Transfer roast to slow cooker (crockpot). Combine salsa, water and remaining seasoning mix; pour into slow cooker to cover roast. Cover and cook on high for three to four hours. Turn roast over. Add potatoes, carrots, and onion. Cover and cook on high for one hour longer. Remove roast and vegetables to serving platter. Let cooking liquid stand five minutes to allow fat to rise. Skim off fat and discard. Make the sauce: Pour two cups cooking liquid into saucepan; cook and stir over medium heat 10 minutes or until sauce has thickened. Serve with roast. Summertime Stuffed Cucumbers. I garnished mine with mixed greens and edible flowers. Cheese and crackers are the good ole standby when it comes to hors d’oeuvres or nibblers during happy hour. Keep a hard cheese like a smoked gouda, a soft cheese like Brie, and a spreadable one like Boursin, on hand in the fridge. Keep water crackers in the pantry and you’re always ready for pop-ins or spontaneous happy hours. For those times when you have a little extra time, here is an easy appetizer. These are a little lighter bite than cheese and crackers which is nice if you plan to serve dinner too. You can vary the recipe according to what you have on hand. Here is my recipe then I’ll tell you how you might change it up it depending on what you have available. If you have a garden with fresh cukes a plenty, keep the other ingredients stocked. Wash and score cucumbers with a fork to give them that fancy look. Cut off the ends and cut the cucumber into approx. one-inch slices. Hollow out the pulp. Mix together cream cheese and milk until softened. Add feta cheese, olives and parsley. Spoon mixture into cucumbers. Garnish with a sprig of parsley. 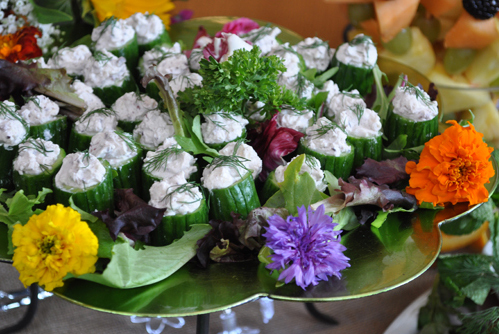 Serve the stuffed cukes on a pretty platter and enjoy. I bet you can think of some ingredients too. Substitute blue cheese for feta. Use only cream cheese and season with fresh chives, basil, or dried spices like Herbes de Provence. Add chopped marinated red peppers or sun-dried tomatoes instead of olives. Use green olives or capers. A dash of Worcester sauce or hot sauce will spice it up. Last Saturday night the air was balmy and the boys of summer were playing under the lights. This is Little League majors division at its finest. Our job as parents: be great fans. It’s not so hard when you have parents like LeeAnn and Glen. They are low key and loyally show up for every game and enthusiastically cheer for their 12-year-old son and the team. Word spread quickly down to my end of the bleachers when LeeAnn said: “Barbara, we have cheese and crackers down here. Tell everyone down there to come down here.” It didn’t take us long to check it out. It wasn’t fancy but it was just what it took to make the night game even more festive and bring everyone together. 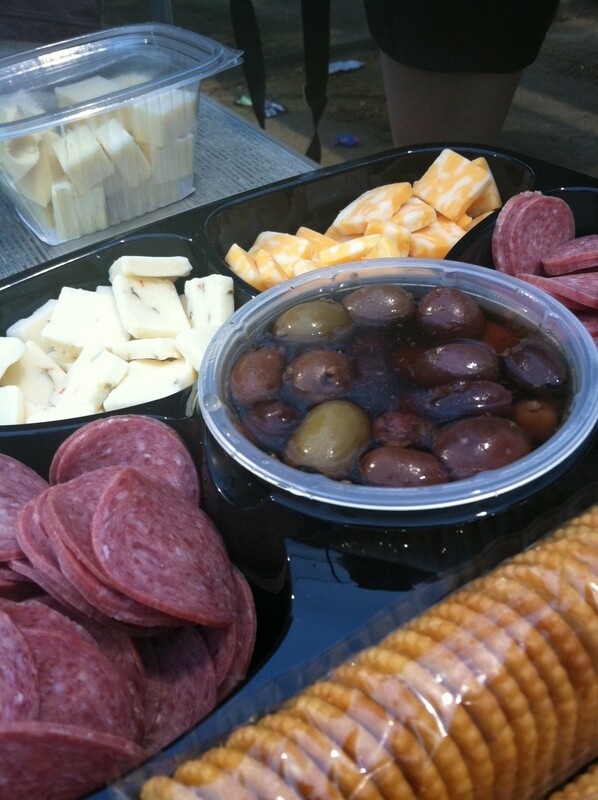 A plastic, pre-packaged tray filled with a variety of cheeses, pepperoni, olives and a few packs of crackers made a party. Add some red-cup libation and that is what I call Bleacher Hospitality. Parties, get-togethers, shindigs, whatever you call them don’t have to be fancy — they just have to be spirited and from the heart. Thanks, LeeAnn and Glen. You know how to throw a party! P.S. : Our team won and our son hit his first out-of-the-park home run. I’m glad I can record the stat in this blog to live in virtual perpetuity because I gave up hard-copy scrapbooking a long time ago. He would be mortified if he knew I’m writing this. Here’s to all the boys and girls of summer and their loyal fans. Now go cheer on your favorite team! These are two of my favorite pleasures….and can you believe they show up in a photo together? I contrived this little display with edible orchids from Gourmet Sweet Botanicals and paired them with my Brownie Blooms and mint sprigs. The photo was taken by Cindy Dyer. For more of her botanical eye candy, see A Garden Muse. 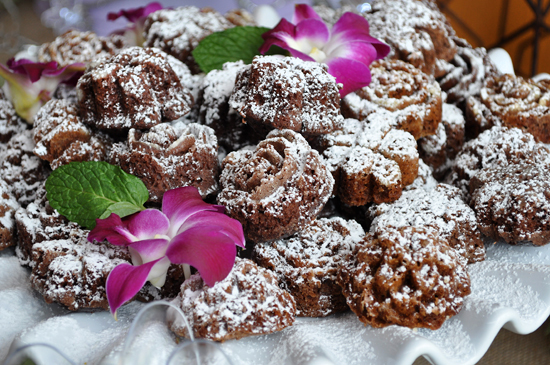 No, you can’t eat the images in her photos, but you sure can eat my orchids and Brownie Blooms.